So I'm absolutely confused. They look pretty much like the exact same thing, and are packaged almost exactly alike down to the same fonts, but they're completely different companies? 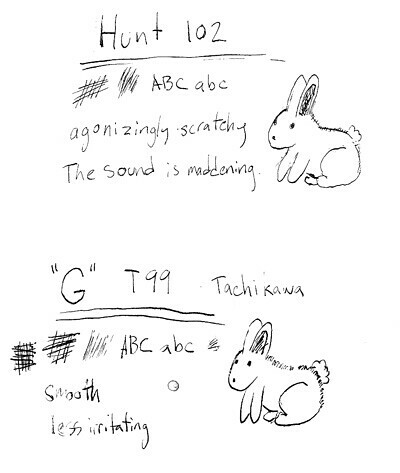 Google turned up Wet Paint, which sells G pens by Nikko, Tachikawa & Zebra, and you can get Deleter G pens (from the source) which Liz tells me are pretty much the same thing. Anyhow, I got home, broke out my old Hunt nibs & some W&N creepy spider guy india ink, and tested how well they each worked for lettering, crosshatching, and sketching. Each one was done freehand, not tracing, and this is how each one turned out. 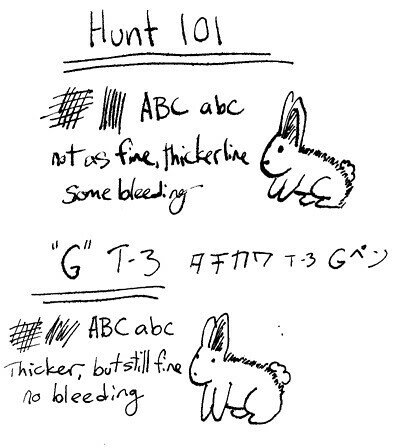 All I really have to say is that if the bunny I drew with the Hunt 102 were real, it would be the bunny kids point to and ask, "Mommy, what's wrong with that bunny?" I officially hate the 102 nib. I don't even think the 102 ever got much use back when I still used my nibs, so I'd hope that maybe I got one of the busted ones or something. About 4 years have passed while the box was sealed & left alone in a drawer, so age could be a factor, but the one I used the most often was the 513, (which I believe Alec Longstreth mentioned in his post) so that one ought to have had the most wear. I'm not that great with nibs, I've been using brushes for years now, so if anyone with more practice wants to have a go, I'd be glad to see what other people can do. Anyhow, I hope this was remotely interesting/educational for someone. The bleeding from the pens could be due to the paper. I have used the Deleter nibs without any problems on hot press bristol board. 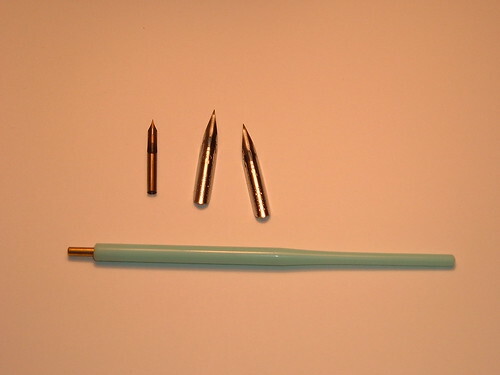 The nibs are well made compared to the more established brands. However, the nibs I found the most useful are the ones made before 1960s, as the metals used in the pens are of higher quality. It's a shame they don't make them like they used to. I really like the T-99 nibs. They crosshatch really well without getting caught into paper and splattering. There is virtually no difference between the companies that make the nibs in Japan. Joe's boss jokes that they are across the street from each other. Speaking of Joe, he's not going to be working at NY Central very soon as he got another job, but hopefully someone else will know about the nibs. I'm sad you didn't get maru nibs! 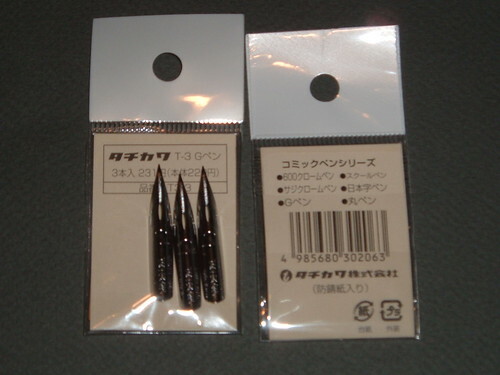 They are the Hunt 102 clones of Japanese nibs and they are the ones I use most often. G-pens are good too though. PS - I recently started using hot press watercolor paper and I am never going back. There is little to no bleeding! didn't know about the paper...thanks liz! i've been using Gillot 303s upon Tom Richmond's recommendation...great control and very smooth turning...no catching like the Hunts. Great post! Thanks for the samples. Anyone know anywhere to get this stuff online? If you Google the phrase "deleter nibs" you will find a cavalcade of links to various online shops. yes! love those japanese nibs! they're so incredible awesome for hatching and line work. It looks like I've come really late to this conversation. Sorry. 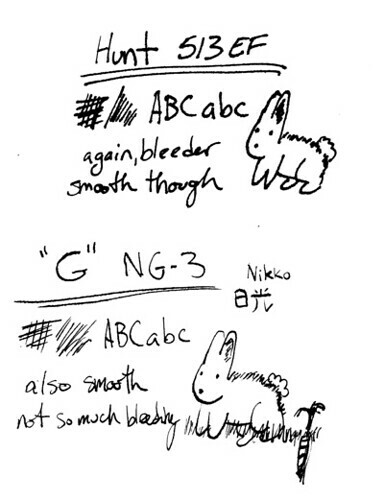 I like the looks of those G-Pens, and I've needed new nibs for some time, so I think I'll try the Deleter Brand. But has anyone tried their ink? Would it be worth buying their white ink? For the longest time I've been trying to find a white ink that worked really well, ie. with enough opacity to write well over a black background. 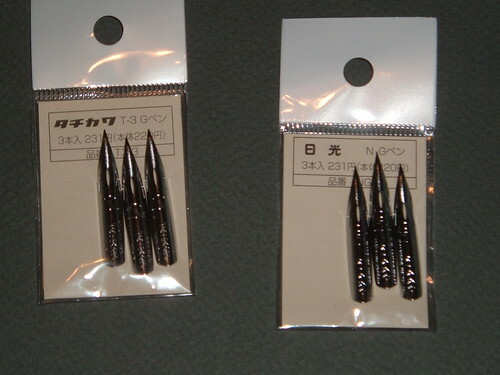 I wanted to let you know that we have a complete shipment of our Japanese Nibs available now here in the states. Please visit us soon.